Support for history-free storage on PostgreSQL, MySQL, and Oracle. This reduces the need to pack and makes RelStorage more appropriate for session storage. Speed. 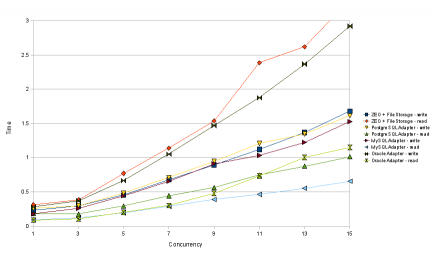 New tests prompted several optimizations that reduced the effect of network latency in both read and write operations. Memcached support is now integrated in a much better way. Support for asynchronous database replication. 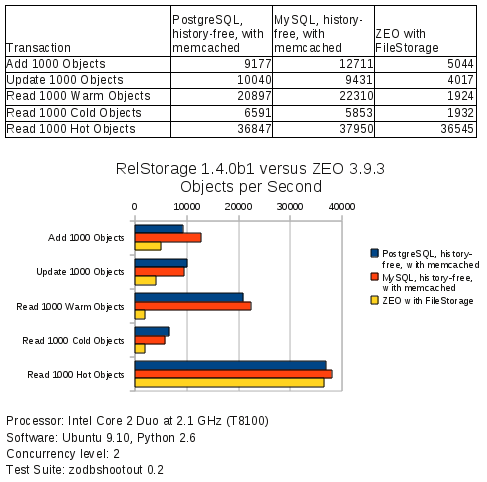 Previous versions of RelStorage worked with MySQL replication, but did not keep ZODB caches in sync when failing over to a slave that was slightly out of date. The Oracle adapter now uses PL/SQL for speed and lock timeouts. Lock timeouts are important for preventing cluster lockup. Moved the speed test script into a separate package named zodbshootout, making it easier for developers and administrators to run comparative performance tests. The adapter code is more modular, making it easier to support new kinds of databases and database adapter modules. 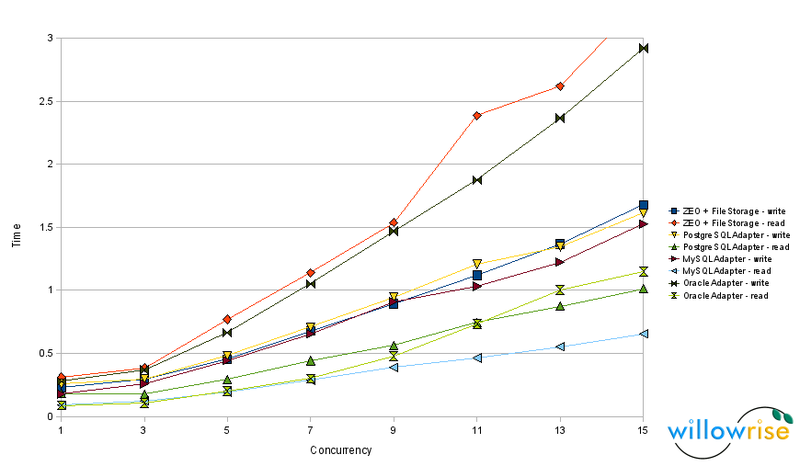 PostgreSQL now beats MySQL in some of the tests. Oracle (not on this chart) is now looking pretty good too. The new features led to far more automated tests. My private Buildbot, which tests RelStorage with several combinations of Python, ZODB, and operating systems (in virtual private servers), now takes 2 hours to run all the tests. Maybe I need to upgrade that server or investigate the possibility of making Buildbot launch an Amazon EC2 instance. 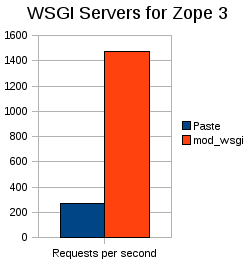 The previous release was 1.3.0b1, which added ZODB blob support. Several customers asked for new features right after I released 1.3.0b1, so I decided to jump to version 1.4.0b1 rather than finalize the 1.3 series. The 1.2 series has had more extensive testing, so use that for a while if you have troubles with 1.4.0b1. This new release should be particularly interesting for Plone users, since Plone is always hungry for faster infrastructure. Posted on April 7, 2009 April 8, 2009 Categories RelStorage, ZopeTags database, RelStorage, session state, ZODB9 Comments on RelStorage for Sessions?